We carry nearly 100 brands and sell thousands of products. It can be a challenge to find what you need. The shop filters are there to narrow down the selection to what you need. We added more advanced filter options to help you find products fitting your needs. 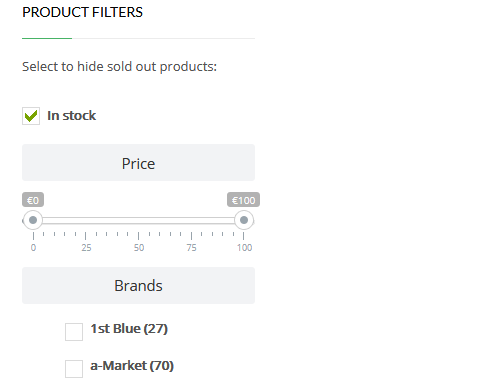 You can now filter products based on price and availability. And we added a more details product classification. The shop filters are placed on the right side of the shop page. If you are using a mobile, then it will be at the top of the shop page. You can combine multiple filters, like show hoodies from the Summer 2019 collections that aren’t sold out (see example). Perhaps your shop focuses on budget brands? Or maybe you only want to order from the higher end products? Our brands and products aren’t classified that way, but with the price filter option you can find the products matching your budget. Just drag the sliders to the prices you want to use as the minimum and maximum price. The shop will then reload and only show the products within that price range. For example: this link shows products costing less than €40 euro. The filter recognizes and matches your currency settings. Our shop page shows products from the current season as well as products from previous seasons. Older products are often sold out but still shown on the website. There will be a clear ‘Out of stock’ note behind the product price to show if it is available or sold out. With the ‘In stock’ checkbox you can easily hide the sold out products and more easily shop what is available. Just check the checkbox. The shop will then reload and only show the products that are not (yet) sold out. Or click this link. Please understand that availability is never guaranteed. It might still occur that products you added to your order are eventually sold out. We will lower your order when it is partially unavailable. In this case we will inform you of this by e-mail as soon as possible. We will also change those products to ‘out of stock’ on the shop page as soon as we find out. 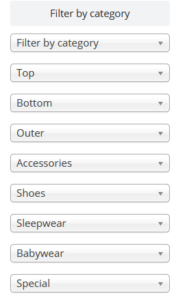 Before it was already possible to filter the products to only show a main category, such as bottoms. Now we added sub categories that allow you to filter within that category and for example only show the skirts, leggings or shorts. And we added a few new main categories like babywear and sleepwear. The category filters are all dropdown menus. 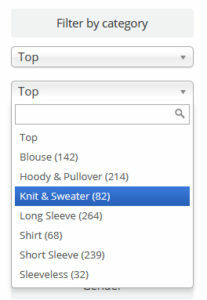 The one at the top allows you to filter the main categories (top, bottom, outer, etc.). The others allow you to right away filter based on sub-categories. The fastest way to reset the filters is to press the green ‘reset button at the bottom of the filter menus. Just click the red X button for the filter that you wish to remove. The page will then reload and show the results matching the new filter settings. On this page we share everything retailers should know about Korean children fashion, the newest products, bestselling brands and how to successfully buy and sell Korean clothing. Here we also highlight some of our company milestones and major improvements to our website.